Their 22nd annual spring concert is happening on Saturday May 20th at Pullen Memorial Baptist Church and Sunday, May 21st at Calvary United Methodist Church. This upbeat celebration of the diversity of American music will feature everything from the glitz and glamour of George Gershwin to patriotic songs and rousing spirituals. The chorus describes it as the “feel good” concert of the year. 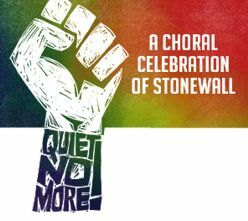 The Triangle Gay Men’s Chorus recognizes the power of music to communicate important truths about common human conditions and the value of all people. The chorus aims to do so by spreading joy every spring season through its live concert series. Both shows start at 3pm and will feature special guest soloist, Jacob Kato. Light refreshments will be served during intermission. The Raleigh concert will feature an American-themed raffle. Tickets are $10 in advance and $15 at the door. To purchase tickets, visit tgmchorus.org and click the “Buy Now” button. The Triangle Gay Men’s Chorus strives to provide a venue for gay and gay-affirming individuals to develop their interests and display their singing talents. A member of the Gay and Lesbian Association of Choruses, their vision is to declare pride and touch lives through bringing brothers together to sing. Founded in 1995, TGMC has performed across the United States and Canada. Under the leadership of Dr. Jay Pierson, the group performs songs from a range of musical genres, such as classical, popular, a cappella, jazz, blues, gospel and music from theatre and film. The group’s 22nd annual holiday concert is happening Saturday, December 3rd at Calvary United Methodist Church as part of their centennial anniversary celebration, and on Sunday, December 4th at Pullen Baptist Memorial Church. In addition to Christmas classics, “The Dance of the Sugar Plum Fairy,” “Mister Santa” and “The Christmas Song,” the concert at Calvary United Methodist Church will feature a new song entitled, “Love Is the Spirit of This Church” as a dedication to the church. “Audiences all over the world are becoming more diverse and the Triangle is no exception. ‘Everything Christmas’ will speak to people regardless of which holiday they chose to celebrate. All of the different messages, coupled with various musical styles are like presents under a tree...there is something for everyone,” said Dr. Jay Pierson, Artistic Director for TGMC. “It’s always a blast learning the notes and getting the dance moves just right. The audience has a great time every year,” said Tyrese Howard, Communications Chair for the group. The concert date in Raleigh will also include a raffle of holiday prizes for concert attendees. TGMC always recognizes the power of music to communicate important truths about common human conditions and the value of all people. It aims to do so by spreading joy every holiday season through its live concert series. The Triangle Gay Men’s Chorus strives to provide a venue for gay and gay-affirming individuals to develop their interests and display their singing talents. A member of the Gay and Lesbian Association of Choruses, their vision is to declare pride and touch lives through bringing brothers together to sing. Founded in 1995, TGMC has performed across the United States and Canada. Under the leadership of Dr. Jay Pierson, the group performs songs from a range of musical genres, such as classical, popular, a cappella, jazz, blues, gospel and music from theatre.